Great progress has been achieved in the management of venous disorders. The possibility of a precise venous evaluation by the mean of a high definition digital colour doppler ultrasound scan has led to a better understanding of the disease and has allowed the development of new treatment techniques that can target precisely the diseased veins. The recent advances of endovenous laser ablation, microphlebectomy combine to revolutionize the treatment of varicose veins and reduce risk even further and neither general anaesthesia nor sedation are necessary. Side effects are minimal and we are now able to treat patients in effective ways that were not formerly possible. Dr. Dhobb and the The Marbella Vein & Beauty Clinic guarantee that every treatment we deliver has been fully validated by international health federations and their results confirmed by extensive studies. Again, the experience of Dr. Dhobb in the vascular field ensures the good application of these treatments in accordance with defining the best indication for each patient. The Clinic provide the most complete range of venous treatments available using the newest technologies. Treatment is minimally invasive, affordable and allows quick recovery. For treatment of large veins, all of Dr. Dhobb´s procedures are done under local anaesthesia and patients are able to walk out of the clinic 1 to 2 hours after completion of the cure. (EVLA) is a new minimally invasive method for treating large varicose veins. Spider Vein Treatment Thread veins or spider veins are similar to varicose veins, but they are smaller. Facial and Hand Veins Facial veins can be erased by a vascular laser. Microsurgical is used to treat hand veins. 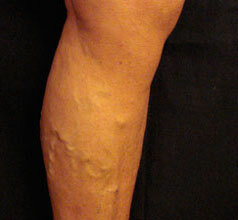 are enlarged veins, colored, often they look like cords and appear twisted and bulging.